Valentines Heart wordpress theme is a beautiful white theme with a special header graphic, showing a big red heart tied with a red ribbon. Below it are a few smaller hearts and black artistic-looking leaves. 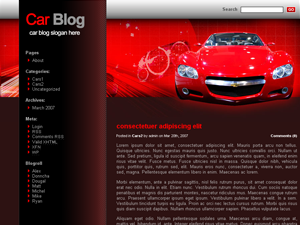 Blog title and tag line are also in the header (left side). This is a 3 column wordpress template with both sidebar supporting wordpress widgets (remember to enable them). The main content area is in the middle (between both sidebars) and is white with elegant black font. The blog’s search function is located just above the main content area and is colored red. 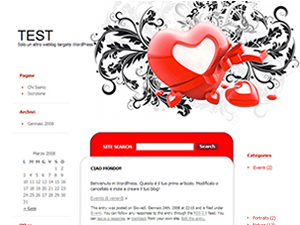 Valentines Heart wordpress template was designed by Marco Mugnaini. This theme is perfect for a love related blog, girly blog or anything having to do with Valentines day. Note: There is a PSD folder (directory) included with this theme. Inside is the photoshop original graphic of your blog’s title (logo). You can edit it in photoshop and modify to suit your needs.